Today, Amazon’s Deal of the Day is a Certified Refurbished Kindle Fire HD 8.9″ with 4G LTE coverage for $80 off. It comes in both 32GB and 64 GB versions. I believe these were unavailable new the last time I looked into buying one…. Be aware that this is a refurbished product, although Amazon does give the same return policy and one year warranty that comes with a new Kindle Fire tablet. The network carrier for the 4G LTE coverage is ONLY available through AT & T. If you want to add a tablet to another carrier, this is not the right one for you. Check the coverage map for AT & T here. The $49.95 promotional data plan originally offered with these is NO LONGER AVAILABLE. Current AT & T data plan rates apply. 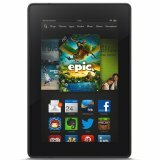 This entry was posted in eReaders, Kindle Fire, Sales and Deals and tagged 4G LTE, deal of the day, Kindle Fire, sale. Bookmark the permalink. ← New Category: Did You Know?